Jennifer is an experienced Chartered Architectural Technologist who has worked in various multi-disciplinary consultancies and architectural practices prior to joining Kier as an Assistant Design Manager. In her current role as an Assistant Design Manager, Jennifer is responsible for a number of tenders — for their authorisation and submission, in order to maximise the order pipeline and its conversion into market share, revenue and operating profit for the business unit. 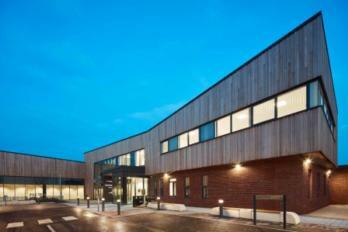 During her two years employment at Kier, her first project was the onsite delivery of a £30m Atherleigh Park Acute Mental Health Hospital for five Boroughs Partnership Trust. This brought many challenges due to the nature of the scheme to ensure a safe environment for the end users. The current scheme she is working on is her most complex scheme to date, a £46m Medium Secure Unit, Maghull for Mersey Care Foundation Trust. Kier hopes to start work on site within a year. Jennifer achieved a 1st Class CIAT Accredited BSc Honours Architectural Technology in 2010 at the University of Bolton. She studied part time whilst working in the architects department of a multidisciplinary design consultancy. Once obtaining her degree she joined the design team of a company that specialised in roofing and cladding, undertaking the responsibility for manufacture drawings, installation drawings, managing the manufacture process and design team’s workload which broadened her technical ability. When the opportunity arose, she took this additional experience and joined an architectural practice as their sole Architectural Technician. It was then she was approached by Kier to become an Assistant Design Manager using her varied experience to aid informing the construction side. She applied to become a Chartered Member via the Professional Assessment route. The process was ‘challenging but also enjoyable’. After a successful portfolio submission and professional interview she became a Chartered Member in July 2015. Jennifer says ‘I have benefited hugely from the qualification from being asked to become a Professional Interview Assessor and speaking to potential new members about their journeys through to being recognised within a company for my achievements and capabilities.’ She says that having ‘the initials’ (MCIAT) after her name signifies her ability.